Thailand Fibre Report 2015, Trends in Fibre Production Thailand, Filament Apparent Consumption. 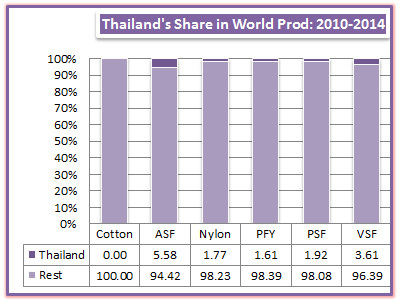 In polyester, Thailand was the eighth largest producer of fibre and ninth largest in filament yarn. Thailand is a major importer of cotton with volumes close to 337,000 tons a year leading to consumption increasing 4% in 2014.